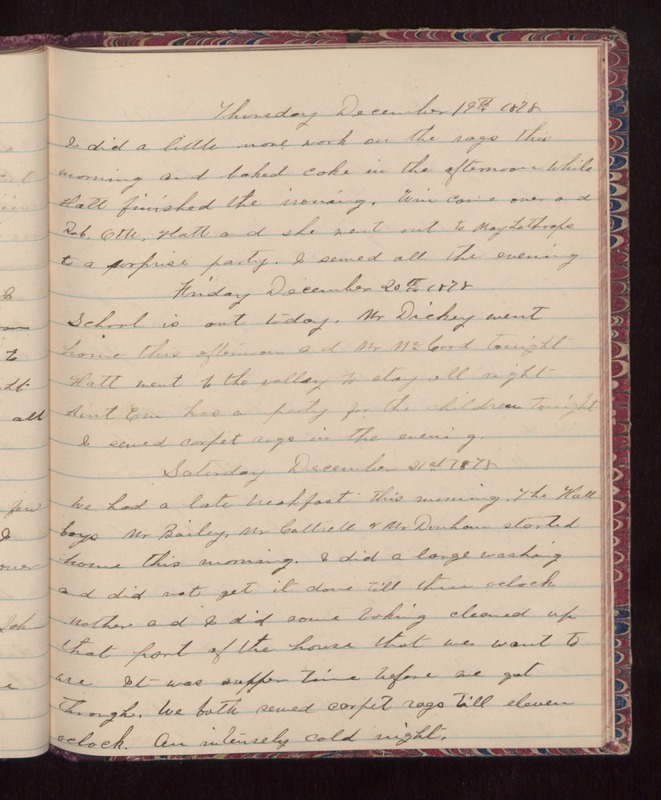 Thursday December 19th 1878 I did a little more work on the rags this morning and baked cake in the afternoon while Hatt finished the ironing. Win came over and Rob, Otto, Hatt and she went out to May Lathrops to a surprise party. I sewed all the evening. Friday December 20th 1878 School is out today. Mr Dickey went home this afternoon and Mr McCord tonight Hatt went to the valley to stay all night Aunt Em has a party for the children tonight I sewed carpet rags in the evening. Saturday December 21st 1878 We had a late breakfast this morning. The Hall boys Mr Bailey, Mr Cattrell & Mr Dunham started home this morning. I did a large washing and did not get it done till three oclock Mother and I did some baking cleaned up that part of the house that we want to use It was supper-time before we got through. We both sewed carpet rags till eleven oclock. An intensely cold night.